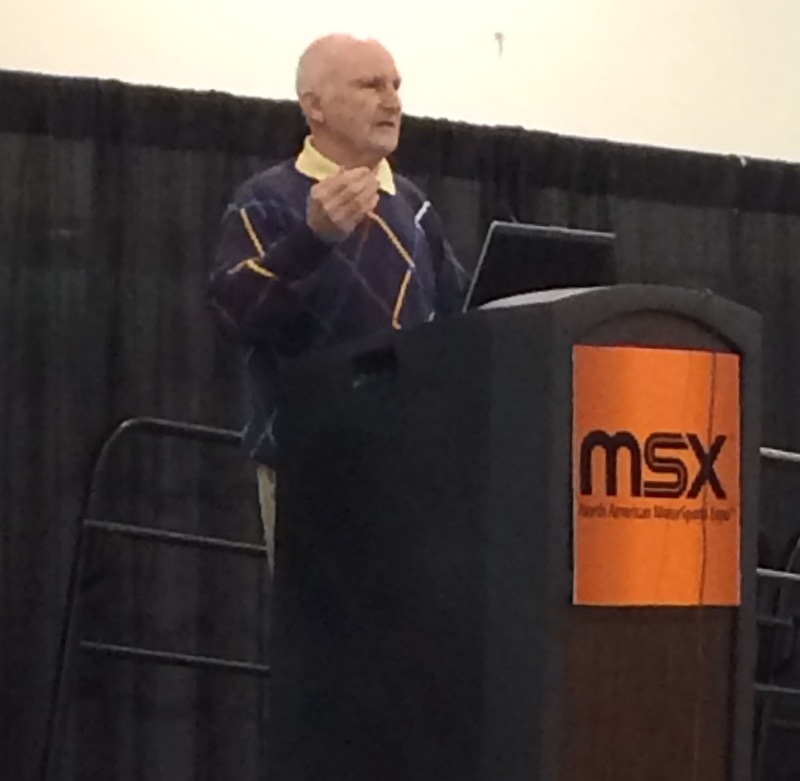 Elliott Forbes Robinson gave an interesting keynote at the SCCA Motorsport Expo last Saturday talking about what he’s learned during his 37 year career in racing. 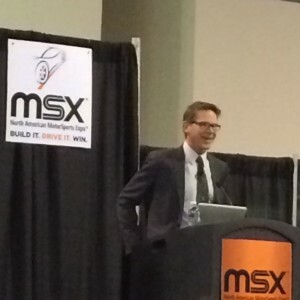 Following along with Randy Pobst’s theme of fear, he noted that if you’re feeling the adrenaline rush while driving, then you’re probably doing it wrong. It should feel awesome, yes; but not exciting. Exciting is often bad and can lead to surprises. And surprises are often bad as well: wheels falling off, fluid on the apex, no brakes, throttle stuck. It’s not that good driver’s don’t make mistakes, it’s more about how they recover. Like good actors who miss a line in a play, the observer may not notice. For a good driver that mistake could be too fast corner entry, or going off course — just without drama. But it is more a matter of style. He always tries to turn in early (something I hear attributed to Mike Skeen once too.) By turning in early, he’s able to make constant adjustments, but more importantly, he can get on the throttle at the right place, every time. He hardly ever trail-brakes and thinks of braking as the least important aspect of the corner. He tries to get all of his braking done in a straight line. As a result he consistently gets better gas mileage while maintaining competitive lap times. 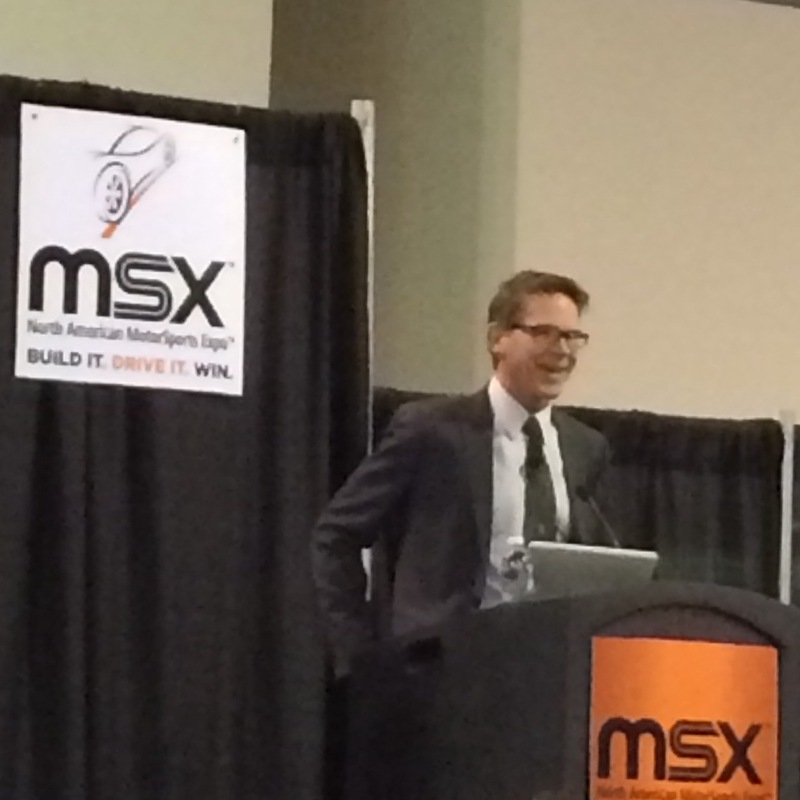 Randy Pobst was the keynote speaker at the first day of the annual SCCA Motorsports Expo in Charlotte, North Carolina last week. His speaking topic was fear, but his message was really about vision. We know instinctively that fear causes the fight, flight, or freeze response. 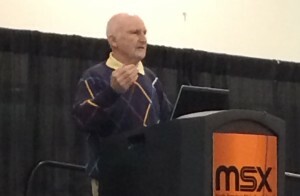 Randy noted that rational fear helps control risk. It can help us perceive scary cars or situations on the track and it nags us to check fluid levels, lug nuts, and safety equipment. But he also observed that fear hurts driving performance as well. When we get the white-knuckle grip on the wheel, our pumped-up forearms are incapable of subtle movements. Instinctively we realize the car isn’t handling right, but the tight grip doesn’t give any feel for what the car is really doing. Fear also adds to the physical and mental workload associated with driving, and can cause a loss of focus, causing the driver to miss flags, gauge warnings, or objects in mirrors. He cautioned that mirror fear also causes mistakes and sets one up for easy intimidation by the competition. That in turn causes timidity, getting run-over, stagnation, missed opportunities, and no improvement. The biggest impact of fear, Randy noted, was that it makes us look at what we fear — the vision connection. It makes us look where we fear we’re going, not where we want to be going. He calls it Mother Nature’s revenge for the industrial revolution: all of our instincts are wrong. You go where you look and your hands just work it out. (So, by Randy’s own admission, you should still be looking at the apex when you hit the wall.) If you aren’t looking where you want to go, you’ll feed in the power at the wrong time/wrong amount. It seems intuitive, but if you aren’t going where you want to go, why do you want to go there faster? Yet you’ll often hear drivers back on the gas in a spin. Look not at what you fear — sound advice. So how do you alleviate fears? You can extinct fears by creating new memories. Always be learning, whether that’s attending driver’s schools, seeking coaching or mentorship, or reading. Randy recommends “Going Faster” by Carl Lopez — the Skippy Bible. But most importantly is to ask for help “especially if you’re bad…” Randy is a huge fan of the skid pad and getting a stable car set-up. Remember, under-steer is frustrating; fear is over-steer. Most importantly, have fun. Thinking about fun reduces fear. 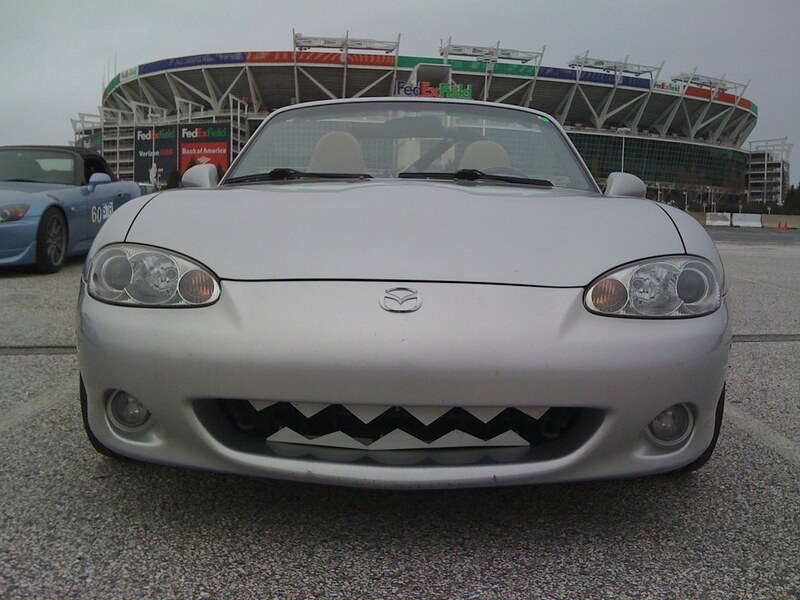 Today was the SCCA practice event at FEDEX Field. It is a non-championship event where drivers can knock off the rust and organizers can try to get their act together before the season starts. It was unusually cold today. Most of the cars in the super-sticky-tire Street Mod class were running street tires for a change, including the GeorgeCo Stealth BMW powered by Beano. Yesterday we had a bit of a set-pack in the suspension department. 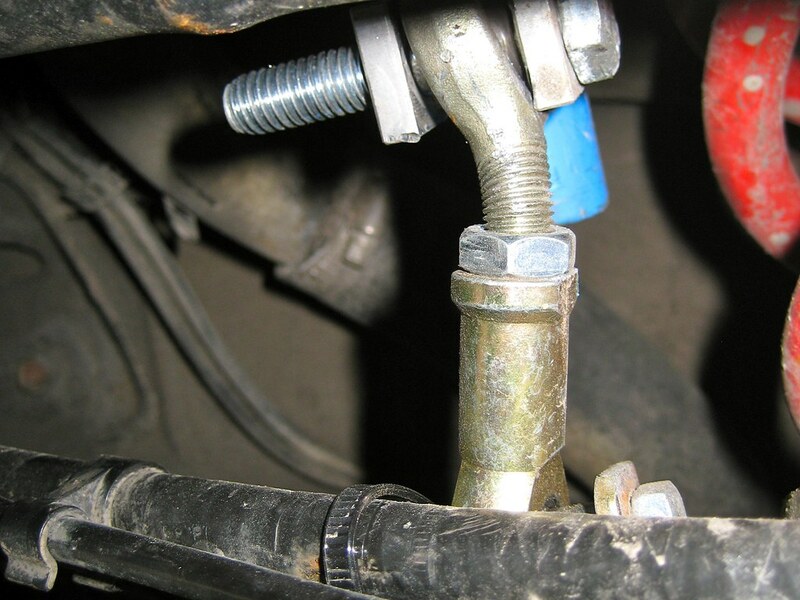 When we went to adjust the rear sway-bar, we found the drop-link was a wee bit bent. Nobody likes having their drop-link bent out of shape. After (quite) a bit of judicious pounding with a sledge hammer and re-cutting of threads, it was almost good as new. 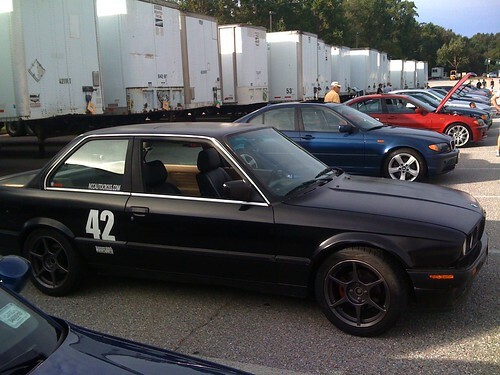 Not really, but good enough for autocross. We won’t run it on the track. Not sure why only one side bent. Don’t remember any wheel-eating DC potholes. There were some interesting cars there today. 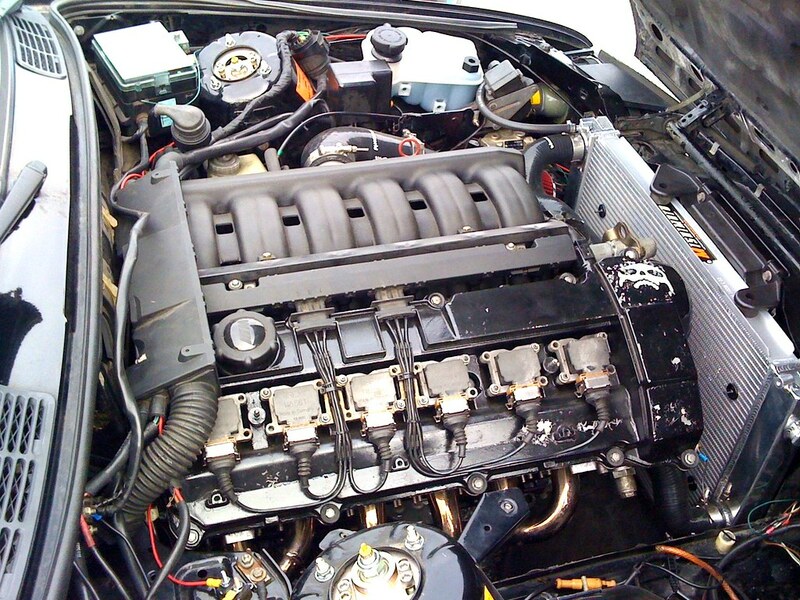 Of special note is Jeff’s E-30 with an E-36 M3 engine. More power. Ho, ho, ho, ho. Unfortunately, no grip in the cold, but if it ever hooks up, watch out. Speaking of all fury, no grip — check out the Home Depot Spoiler on this C6 Z06 Corvette. Chapterfest marked the end of the Summer for the GeorgeCo BMW Powered by Beano. 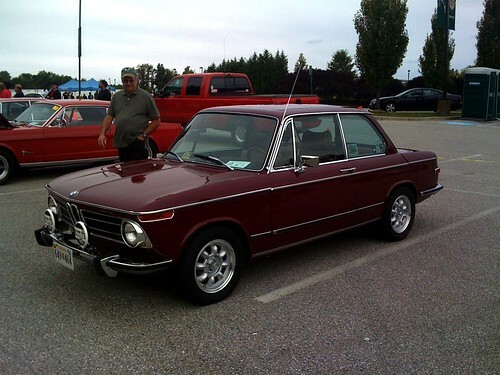 The annual event sponsored by the National Capital Chapter of the BMW Car Club of America brings together the diverse sub-groups of 6,000+ member chapter into one event. It features a swapmeet, shine & show, good food, and of course autocross. No video from the autocross. Another autocross season down, another dead video camera I’m afraid. I’m going to have to invest in a solid-state recorder of some sort. The course was more challenging than it appeared during the course walk. The course designers decided to use the lower lot at Baysox Stadium this time. To get there and back, the course has to pass through a couple of islands in the parking lot. That risk means designing very slow sections before the entry to the pass through. This caught out a lot of people, but since going fast by going slow is what the GeorgeCo BMW Powered by Beano does best, it was no problem for us. Rain spoiled the times for the fourth heat runners, but running in the second heat, we managed to take first in class, solidifying our position going into the season finale next month. 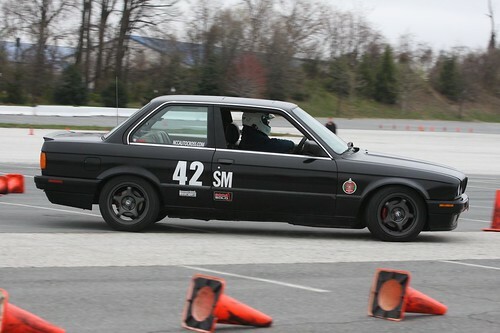 Sunday brought the sixth championship event for the Washington DC Region of the SCCA at FEDEX Field. 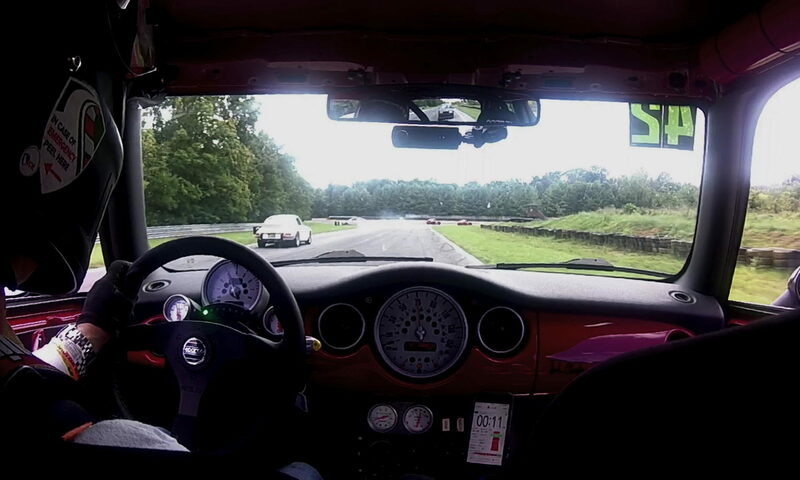 In this series, we’re running the GeorgeCo Gas-X MINI in the Street Mod class. The only car on street tires as well as the only true daily-driver in the mod-till-you-drop Street Mod Class, the GeorgeCo Gas-X MINI has a significant disadvantage to the stripped-out, higher horse power cars in the class running on competition tires. That is, until it rains. We almost achieved greatness yesterday. Almost. It rained heavily during the fifth heat. 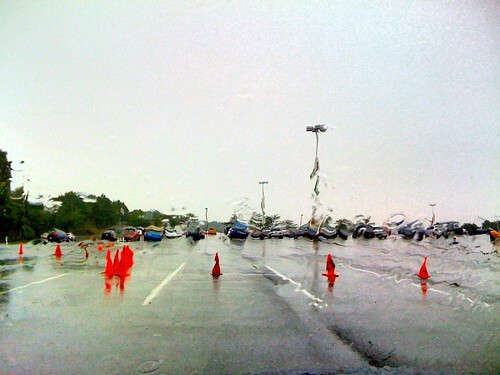 At the start of the sixth and final heat, the course was very damp and slick. At the start of the second of four runs, the GeorgeCo Gas-X MINI was in the lead. Unfortunately, the sun was still shining and the course was drying and we saw our advantage slip away. Nonetheless, the car ran well and the course was challenging. Perhaps just as interesting were some of the other cars that were at the event.